Polk Audio MW 6502 4 Ohm 6.5" Woofer / Monitor 5, 5 Jr, 5B, 7B, M5 & M7 Series 2. Shipped with USPS Priority Mail. RT12 and others. Monitor 7B. Will fit Polk Audio. Pulled these from a Polk Audio Studio Monitor series II. Coils look fine and the capacitor is fine, not leaking or bloated. Tested these before i pulled and it worked fine. Car Speakers. Speakers, Receivers & more. In-Ceiling Speakers. Marine Audio. Great sound while out on the water. Surround sound systems & more. Car Alarms / Radar Detectors. Two 2-way speakers. Car Audio & Video. Marine Speakers. Car Audio Accessories. Surround Sound Systems. Audio Devices. Car Speakers. Car Alarm Systems. Two 2-way speakers. Everything included is shown. 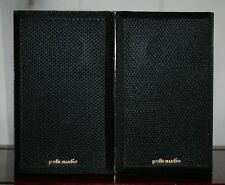 Polk Audio Monitor Series 4. ~ SPEAKER CROSSOVERS ~. REPAIR PARTS. FREE SHIPPING - Same Business Day - 30-DAY RETURNS! Although these grilles are new and have never been used, they have a few minor scuffs from being in storage for all these years. Each grille is 2 pieces. A steel ring mounts under the woofer.